Next Cliff's Notes For Your Life! Whenever I hear about The Great Gatsby, my mind shuttles to a passage of Haruki Murakami's Norwegian Wood, one of my oft-read favorite novels. Like me, the protagonist Toru is a serious rereader: “This is my third time through [Gatsby], and every time I find something new that I like even more than the last time.” So it's not too surprising that The Millions (and a linkedGuardian article) posits The Great Gatsby as the most “rereadable” fiction. Since my rereading habits tend to change with the seasons, let me offer a few recommendations for winter nesting, summer tanning, astral projecting, and more. • Cocooning for the winter: I plowed through Fyodor Dostoevsky's The Idiot and Crime and Punishment in a chair next my studio's radiator, where the hiss and clatter of pipes covered whatever music was playing the background. To me, they're the most cold-weather appropriate of this Russian's enveloping oeuvre. • Beach jaunts: Thomas Mann's Death in Venice radiates with dry summer heat and soothing Adriatic air, and its novella length is perfect for beach reading (tack on 45 minutes for the Nassau County train ride). Dostoevsky's short novel The Gambler is another warm-weather favorite—and I'm admittedly smitten with Mlle Blanche de Cominges. 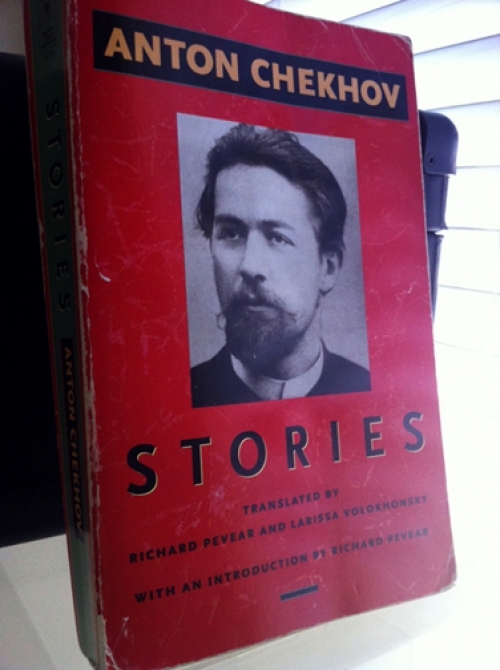 • Emotional inspiration, in brief: Anton Chekhov's short stories never fail me. “The Huntsman,” “Anyuta,” and “The Black Monk” are major tearjerkers—and with Chekhov's unbelievable gift for brevity, “The Huntsman” achieves this over barely four pages. I share these with girls to show them that I am a sensitive dude. • Emotional inspiration, long read: Zadie Smith's The Autograph Man...and yes, I love White Teeth as well. I met Smith at a reading back when The Autograph Man debuted (she read the prologue, another significant tearjerker), and I've returned to her idiosyncratic second novel ever since. • Far East escapism: Haruki Murakami's pop psychedelic The Windup Bird Chronicle. I've written about this before for Black Balloon, and it's my go-to for getting “away." Plus, Dance, Dance, Dance is one heady trip (psychic teenagers and talking sheep, anyone?). • Even farther (like another universe) escapism: Douglas Adams' The Ultimate Hitchhiker's Guide to the Galaxy, or as the subheading reads: “five novels in one outrageous volume.” I tend to tucker out at So Long, and Thanks for All the Fish, but it's still a stellar ticket outta here. Towel not included. For my fellow rereaders, I close with a helpful tip. See, my Manhattan studio couldn't accommodate a proper library, but my reading habits demanded one. To combat my finite space, I read and re-read certain novels until I'd exhausted them, and then I shipped them back to my parents so I could buy more. But the Murakamis, the Russians, Zadie...those I made room for. Who needs a bathtub, anyway?